In an effort to improve our neighborhoods and city streets, the City of Lancaster conducts a variety of road construction projects which will ultimately benefit our citizens. 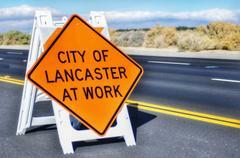 While these construction zones typically restrict traffic flow for an interim period, the results provide smoother roads and better infrastructure in various locations throughout Lancaster. Additionally, a number of community events take place year-round throughout the City, resulting in temporary traffic detours during event setup, activity, and breakdown. The City of Lancaster strives to provide as many opportunities as possible for community gathering and engagement. The BLVD Market is an opportunity for the community to gather and enjoy an offering of fresh produce and unique items in an open market atmosphere. The Market’s fall and winter hours are 3 – 7 p.m., every Thursday on Lancaster Blvd., between Ehrlich Avenue and Fern Avenue. This area will be closed to traffic and parking from 1 – 11 p.m. on Market days. On Saturday, March 16 there will be a full closure of Sierra Highway from West Avenue H to West Avenue G-12. The closure will be in effect from 6 a.m. – 4 p.m. Drivers will be advised to use a specified detour route during this time. Lane closures at 10th Street West and Avenue I due to Public Works Construction Project 17-012. Scope of work includes traffic signal modifications and pedestrian bulb-outs, in addition to multiple utility and infrastructure improvements. Through May 28 expect intermittent lane closures on 5th Street East between Avenue H-8 and Avenue J-4 for sidewalk and street improvements related to Public Works Construction Project 17-009. The intersection of Lancaster Blvd. and 15th Street East will be closed to traffic through May 30 due to Public Works Construction Project 17-007, the Lancaster Blvd. and 15th Street East roundabout. Drivers are encouraged to utilize an alternate route. Intermittent lane closures in the vicinity of 15th Street West and Lancaster Blvd due to Public Works Construction Project 17-006 Rebid, The Lancaster Blvd and 15th Street West Roundabout. The traffic signal will be in four-way “red flash” mode. Expect delays. Sidewalk closures on Kildare Street, Gadsden Avenue, and Lancaster Blvd. near The BLVD Starbucks location are due to construction related to the Marriott Hotel development. 60th Street West is closed to thru traffic between Avenue J and the entrance to the California State Prison due to private development storm drain improvements.